Screening of "King Kong" with Victoria Riskin. Showing begins at 11:00 am. Screening of "Magic Town" with Victoria Riskin. Showing begins at 4:00 pm. Screening of "Meet John Doe" with Victoria Riskin. Showing begins at 6:10pm. 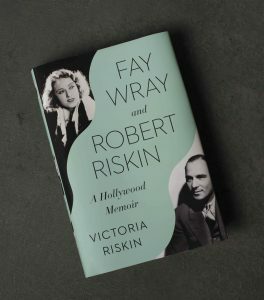 Book signing and discussion with Victoria Riskin on "Fay Wray and Robert Riskin: A Hollywood Memoir" at the NYU Bookstore. Book signing and discussion with Victoria Riskin on "Fay Wray and Robert Riskin: A Hollywood Memoir" at Politics and Prose, located at Union Market. Screening of "Projections of America" with Victoria Riskin. Showing begins at 1:00pm. Screening of "King Kong" followed by a discussion and reception with Victoria Riskin. Screenings of "Meet John Doe" followed by a book signing with Victoria Riskin. Showing of "Meet John Doe" begins at 2:00 pm. Book signing begins at 7:45 pm. Screening of "King Kong" followed by a book signing with Victoria Riskin. Showing of "King Kong" begins at 5:15 pm. Book signing begins at 7:45 pm. Huntington Beach Library, 7111 Talbert Ave. Author's Luncheon featuring Victoria Riskin. More information to come.